Losing even one tooth throws your entire smile out of balance. Over time, remaining teeth shift out of place, and you may experience jawbone resorption, which can alter your facial structure and make you look older. 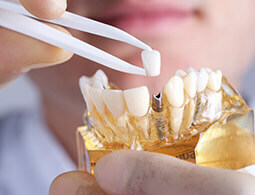 There are two ways to replace the missing tooth: crown and bridge or single tooth implant. As a periodontist, Dr. Grossman has the experience, skill, and training to provide dental implants for patients from Chestnut Hill that are missing one tooth. With a bridge, surrounding teeth receive crowns to anchor the restoration. This means some amount of tooth reduction, and stress and pressure from holding a replacement tooth after the bridge is placed. Dental implants function as their own anchors, so no surrounding teeth are affected. A single tooth dental implant offers the most aesthetic, hygienic, and natural alternative. In addition to formal dentistry education, a periodontist receives three years of additional training. Dr. Grossman graduated from the University of Pennsylvania School of Dental Medicine, completed his one-year general practice residency and then graduated from the two-year periodontal specialty program at Boston University School of Graduate Dentistry. Dr. Grossman’s membership in the Academy of Osseointegration (the study of dental implants) certifies his expertise in dental implantology. With more than 30 years of practical experience, Dr. Gross now shares his expertise as a clinical instructor at the Harvard School of Dental Medicine, and he is the periodontist on staff with Emerson Hospital. For Dr. Grossman, placing a single dental implant begins with precision planning. Using detailed x-ray images that show the structure and density of your jaw, he determines exactly how the implant should be positioned in order to take advantage of the greatest volume and density of bone. This helps to ensure a secure integration between the implant and surrounding bone tissue. Once the plans are set, the actual procedure can begin. After a administering a local anesthetic to the site, Concord periodontist Dr. Grossman makes a very small incision in your gums in order to expose the bone underneath. Then, the implant is embedded. The site may be sensitive for the first few days after surgery. Most patients find that ibuprofen or acetaminophen eases any discomfort. You may also want to chew on the other side of your mouth for a short while. While you heal, the implanted post integrates into your jaw in much the same way as a tooth root. Dr. Grossman will monitor the implant and when he’s certain that you’ve healed completely, you’ll return to your restorative dentist to have a lifelike porcelain crown attached to the implant. If you have more than one tooth that requires replacement, implant-supported dental prosthetics are also available. Would you like to learn more about replacing a single tooth with a dental implant? Contact one of our offices today to reserve your implant consultation. As a periodontist, Dr. Stephen Grossman has the training and expertise to provide exceptional care to patients from Wellesley, Sudbury, and all surrounding communities. We look forward to serving you.